DENVER, USA – The fastest-growing category for its bicycle belt drives is e-bike and to continue its push into this product category, Gates Corp, maker of the Gates Carbon Drive system, joined the Light Electric Vehicle Association (LEVA). 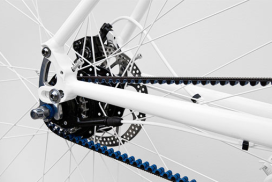 To educate LEVA members about Carbon Drive, Gates will partner with the trade association to provide seminars, training and technical information about belt drives on e-bikes. E-bikes are now the fastest-growing category for Gates Carbon Drive, launched in 2007 on mountain and city bikes. Recently Gates introduced its own branded cranksets that come pre-assembled with Carbon Drive sprockets, saving bike makers the time and expense of sourcing and installing cranks separately. “We are now working with Yamaha, NuVinci and Panasonic to provide sprockets for their e-bike systems. Our goal is to have a Gates belt drive option for every e-bike system in the market,” said Todd Sellden, director of Gates Carbon Drive.